Sebastian Vettel said revealed that Ferrari's sudden return to form in qualifying for the United States Grand Prix was aided by the removal of upgrades previously brought to the car. Ferrari were reported to have lost seven tenths on average in lap time after introducing new parts in Singapore, where Mercedes began a run of dominance that has put Lewis Hamilton on the verge of a fifth world title. 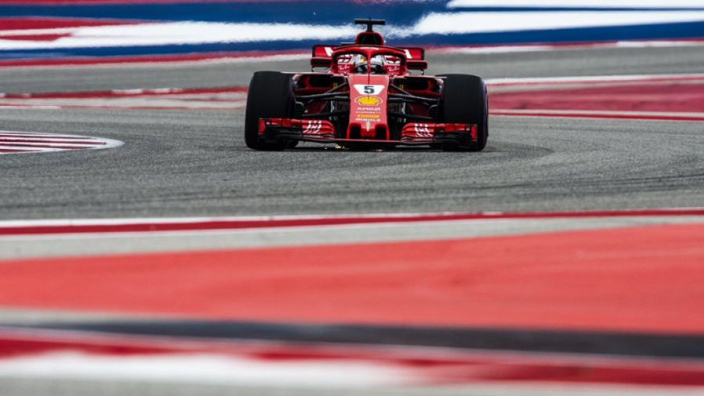 After seeing Mercedes 1-2 finishes in Russia and Japan, Ferrari hit back in Austin, Texas to split the Silver Arrows in the classification. Although Vettel will drop to P5 for Sunday's race, Kimi Raikkonen will start alongside pole-sitting Hamilton on quicker tyres – giving Ferrari the chance to manipulate strategy if the Finn can get a good start. Both Vettel and Raikkonen were within a tenth of a second of Hamilton's lap-record pole time, something that pleasantly surprised the German. "I can't change the penalty now obviously, it is what it is. But, yes, we went back with our car quite a long way and it seems to perform better now." He added: "I think if the gap is less than a tenth then you have to think there was probably a little bit left in the car. "But I was pretty happy with the laps that I had to be honest. "Today has been a positive surprise I guess to see how competitive we have been today given how far we've been behind for the last two races. There are some positives but if you are that close you probably want to be ahead."